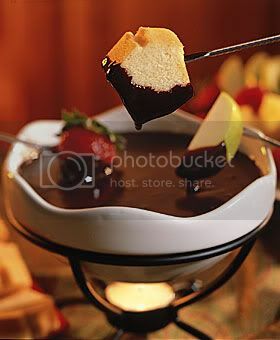 Chocolate fondue – 望み – What is that you desire? My friend of infinite wisdom questioned the very existence of the whole chocolate fondue thing. Fondue refers to several French Swiss communal dishes shared at the table in an earthenware pot (“caquelon”) over a small burner (“réchaud”). The term “fondue” comes from the French “fondre” (“to melt”), referring to the fact that the contents of the pot are kept in a liquid state so that diners can use forks to dip into the sauce. Though cheese fondues are perhaps the best known kind, there are several other possibilities for the contents of the pot and what is used for dipping — recipes are not entirely fixed and vary depending on the cook. It’s chocolate in the guise of ‘healthy fruits’. Many think ‘Oh, it’s just fruits covered with chocolate, doesn’t hurt much to try.’, but it’s still gotten fatten you up in any case. Given the mentality of ‘hey-i-am-eating-fruits-covered-in-choco-its-healthy’ , I dare not think of the obnoxious consequences after eating them. It’s just like eating chicken nuggets. Parents could try dipping brocolli , carrots or Fat choy even into melted chocolate. Try doing cheese fondue, you can force kids to eat potato covered with melted-cheese. That’s a pretty witty method. Try it with meatballs or bread. I am just looking for some really good blog sites for reading. I had been seeking over bing and google and discovered your blog post. Nicely i love your professional blog design as well as your authoring skills. Keep doing it.